Don't worry, be Happy: A- Z challenge - "H"
Well, here I am again for another day and I confess it seems to be getting harder. Today is "H"
I pondered this yesterday and couldn't think of anything. Last night I saw something on TV, some statistics about how many hours a day children play outside compared with a few generations back. I can't remember all the details but it was something like 4 hours 50 years ago and 1 hour now. They also said that lots of children had never built a sandcastle or flown a kite. Again I can't remember the numbers. It made me think about my own childhood where we always played outside. We had a green in front of our house and we would play there. We used to cycle around it on our bikes. Sometimes in the summer the Mums would sit out there and chat but much of the time we were unsupervised. My own children were allowed to play outside but only in the square in front of our house or on the hill at the back where I could see them. They were not allowed beyond there and while they were quite young I would sit on the front doorstep to watch. My grandchildren are not allowed to play in the street although all of them play outside in their gardens. Where am I going with this? Oh yes..... 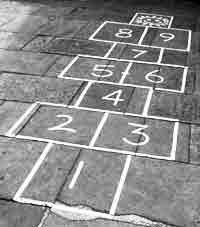 I started to think about my childhood games and my favourite was Hopscotch. Who remembers that? For anyone younger who might not, I will explain. You used chalk (or a pebble) to draw a grid on the ground with numbers up to 10 and then you rolled a stone and had to hop and jump to that square. It was great fun and cost no money. Simple pleasures. I wonder what today’s children would make of it. I shall have to try it out with the grandchildren. So “H” is for Hopscotch.